With nearly two decades of experience and thousands of successful projects, Laragen proudly offers DNA sequencing services that you can rely on. We use proven technology and provide secure access to your results through our web interface. Next day turnaround is standard, with same day service available upon request. The key to having long sequencing reads is the quality and quantity of the DNA. Average reads can be up to 1000 bp depending on the DNA quality and primer sequences. Too much or too little DNA and dirty DNA is the main cause of the reaction failure. For sample preparation, we recommend using the Qiagen miniprep kits to prepare plasmid DNA. Certain commercial kits do not work well with automated Sanger sequencing. EDTA has also been found to inhibit DNA sequencing reaction. In this case, do not elute DNA into TE buffer. Please use only molecular grade water or Qiagen EB buffer (10 mM TrisHCl, pH 8.0). For 96-well plates, please arrange samples by the columns, not by the rows: You can use “Upload Sequencing Requests Using Excel” link in our DNALIMS system to upload the 96-well plate format. A link in this field is available to download for file upload. No spaces or special characters are allowed in the DNALIMS. Allowable characters include: a - z, A - Z, 0 - 9, and hyphens. You can also use this Template for file upload. Please seal the 96-well plate with caps, foil tape or heat seal tape tightly to avoid possible cross contamination and sample evaporation. 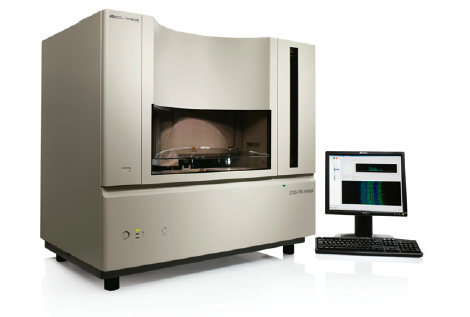 Laragen provides research and GLP grade (compliant with FDA CFR 21, Part 58) Sanger DNA sequencing services. This is the most economical sequencing service. With the ready-to-run sequencing service, you will set up your own cycle sequencing reactions with BigDye. If purification is not required and you have already cleaned up your reactions, please indicate so in the comments field of the order form. Samples are then loaded to our ABI 3730XL. For sample preparation, customers will perform their own sequencing reactions in 8 strip PCR tubes with 10 ul of reaction volume. Please do not label the PCR strips on the caps, instead use the side of the tubes for labeling. To fill the order form for ready-to-run samples in our DNALIMS, please choose the primer field as NA to avoid confusion. We recommend using the following protocols to do sequencing reactions. We recommend using the following protocols to do sequencing reactions. Premix sequencing service is designed for customers who want to save sequencing cost, but do not want to set up their own ready-to-run sequencing reactions. With this service, customers will measure the DNA concentration and mix 400-600 ng of plasmid DNA and 10 ng for every 100 bp of PCR fragment with 5 µL of 10 µM of sequencing primer in a total of 10 µL using molecular grade water. Samples can be provided in 8-strip PCR tubes. Please do not label the PCR strips on the caps, instead use the side of the tubes for labeling. We recommend using Qubit or other fluorometers to measure DNA concentrations. NanoDrop and other spectrophotometers tend to provide inaccurate DNA concentrations. Many commercial PCR purification kits are not robust enough for DNA sequencing purposes. One of biggest challenges is that the recovery yield is quite variable with these commercial kits. Laragen has developed a proprietary PCR purification technique to overcome this low and uneven yield issue. This service is similar to the purified template sequencing service except we will purify PCR DNA for you. With this service, customers will perform PCR reactions in 30 ul volume and run 5 ul on an agarose gel. If there is a single band in the PCR product, send us the rest of the 25 ul PCR DNA. It will help us to have a gel image picture along with the samples. No purification is needed. Laragen will perform PCR purification. We also require 5 ul of 10 uM primer for each sequencing reaction. Please do not label the PCR strips on the caps, instead label on the side of the tubes. By far, this is the most common service we provide. With this service, you provide us with purified plasmid or PCR DNA templates. Unlike most of our competitors whom depend on customers’ DNA concentrations, Laragen measures DNA concentrations of every single sample with our fluorometer and normalize them accordingly. This procedure enables us to have good sequencing quality and long reads. For sample preparation, please send 15 to 20 ul of purified plasmid and PCR DNA at concentrations between 50-100 ng/uL; more volume should be provided if multiple reactions are required per DNA. Samples can be submitted in either 8-strip PCR tubes or in individual 1.7 ml Eppendorf tubes and 5 to 10 ul of 10 uM primer in separate tubes. Again, more primer volume should be provided if multiple reactions are required. Laragen also provides free common sequencing primers; in which case, you do not need to send the primers which we provide in-house as long as the primer reactions are itemized on the order form. If samples are sent in Eppendorf tubes, please label the sample name on the cap. If samples are sent in PCR strips, please do not label on the caps; instead label on the side of the tubes. The RCA technique is especially good for low copy number plasmids and will save you time from preparing the miniprep. The RCA technique amplifies the circular plasmid DNA from bacterial cells and the amplified DNA is sequenced directly. The turnaround time for this service is two business days, but we do not process RCA’s on Friday due to the high denaturation state of the RCA DNA stored over the weekend. Please do not send RCA orders on Friday. Low density cell culture: This is the most popular format. We accept 500 ul of 2x LB overnight culture at 37oC with shaking at 300 rpm in deep well culture blocks. The culture block should be sealed with airpore tape. For the shipping purpose, we recommend you send the cell pellets by centrifuging and decanting the culture medium. The pellets need to be sent on dry ice to keep frozen. Glycerol stock: 50 to 100 ul of glycerol stocks can be sent frozen on dry ice in 96-well plates. Seal plate with foil tape or caps. Bacterial colonies on agar plate: The colonies on the agar plate need to be well separated to enable us to pick a single colony. If you need the colonies back, please number the colonies so you can match the sequencing results with the colonies. Wrap the plates with parafilm. Our primer walking service includes primer design and synthesis, sequencing reactions and sequencing assembly. Our low price primer walking sequencing service only charges for the cost of the primers and the purified template sequencing reactions. For sample preparation, please send 20 to 30 ul of purified plasmid and PCR DNA in 1.7 ml Eppendorf tubes and 5 to 10 ul of 10 uM original primers (if any) in separate tubes. Laragen will design and order the necessary primers to finish the complete sequences. In most cases, we can get 700 to 800 bp per primer read. Using Laragen's proprietary protocols and techniques, we can handle your difficult templates! It will expedite the sequencing results if you inform us if the sequence contains the following structures: shRNA, RNAi, hairpin, GC rich motif, AT rich motif, or bisulfite-converted DNA. Please check GC yes field in the online request form when submitting these sequences and indicate in the comments field that samples are difficult templates. Additional charges apply. For sample preparation, Customers can send us 10 to 15 ul of purified plasmid and PCR DNA either in 8-strip PCR tubes or in individual 1.7 ml Eppendorf tubes along with 5 to 10 ul of 10 uM primer in separate tubes. Additional DNA and primer volume will be required for multiple reactions. If samples are sent in Eppendorf tubes, please label the sample name on the top cap. If samples are sent in PCR strips, please do not label on the caps; instead label on the side of the tubes. Laragen’s BAC end sequencing is optimal for BAC or plasmids greater than 100kb. This service can be requested by selecting “BAC” as the DNA Type on the order form. Additional charges apply.